Olio Devices is a new, design-focused company that creates high-quality, carefully-crafted watches. Their different watch styles are all designed to be functional, enduring, and expressive. With Big Apple Buddy’s personal shopping service, you can now buy direct from the Olio Devices online store anytime, anywhere. 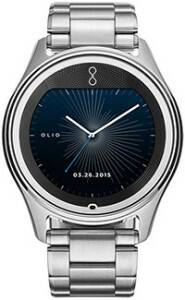 The Model One Steel Metal Link Bracelet Watch is part of Olio’s Steel Collection. This watch features a custom watch face that is designed to complement its impressive and sleek hardware. With four different settings, this watch also comes with its fair share of versatility and personalization. You can make it analog or digital with the press of a button, and there different settings for daytime and nighttime so that the time is always easily accessible to you. This stainless steel watch makes a sleek and convenient accessory. 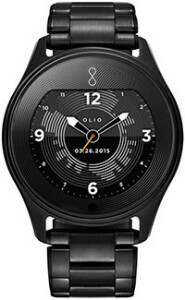 Olio also has a Black Collection of watches, which includes this elegant Model One Black Metal Link Bracelet Watch. This collection also has three other bands to choose from: black, brown, or suede leather. This collection has the same options of versatility as the Steel Collection: you can choose to make your watch digital or analog, and there are different settings designed to help you see during the day and the night. You don’t have to be worried about getting this watch wet either, since it’s water-resistant up to 50M. 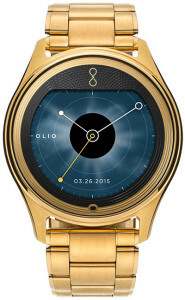 There are more watch options to choose from in Olio’s Gold Collection. Choose between a metal link, black leather, or brown leather band. Made of 24-karat gold and with a stainless steel substructure, this sleek and elegant watch will add an instant touch of flair to any outfit. This watch is also compatible with iOS and Android, so you can use Bluetooth to sync it up with your smartphone. Unfortunately, the USA Olio Devices online store does not currently offer international shipping. However, Big Apple Buddy, your personal shopper, can help you buy products direct from the official USA Olio Devices online store and ship them to your doorstep, no matter where you are in the world. If you would like to buy from the USA Olio Devices online store, simply let us know which items you would like to order (by filling out the form below) and we’ll get back to you with a free international shipping quote within 24 hours!